Last Sunday, many of those closest to J. Moore gathered at Ciudad in Seattle, one of the venues owned by Jon’s longtime friend and business partner, Marcus Lalario. It was held 2 days after Jon’s 48th birthday on April 21st, which I’m happy to say is now officially known as Jonathan Moore Day in the City of Seattle. Dope to see one Mayor recognize another. The memorial at Ciudad was a great event (albeit a bit heavy on the Egyptian Musk) and we had a blast catching up and remembering J’s life. Everyone grieves in different ways, but one thing’s for sure: J would want us to focus more on celebrating life than mourning it. The building was filled with life, love, laughter, and music, all things that I’ll forever associate with Jon. Thank you to everyone who came through and special thanks to Marcus for organizing the event. 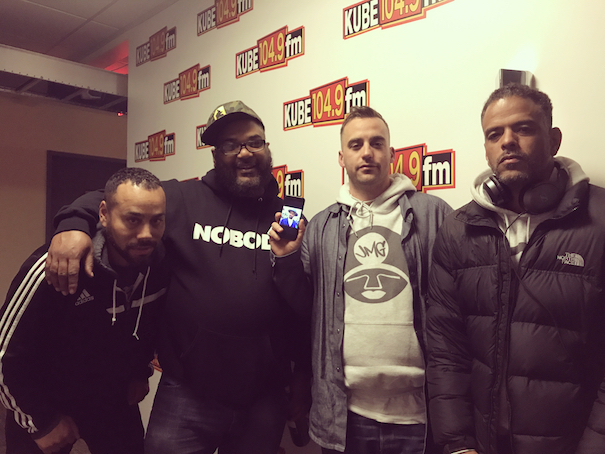 Marcus, Upendo, DV-One, and Maseo from De La Soul all came through Sound Session to kick it with DJ Nphared and I after the festivities. We played new tracks from artists like Big Boi, Killer Mike, Organized Noize, Joi, Snoh Aalegra, Vince Staples, Gorillaz, Pinder, Kendrick, Black Thought, Talib + Styles P, ANoyd, Little Dragon, Porter Ray, Dave B, and more. 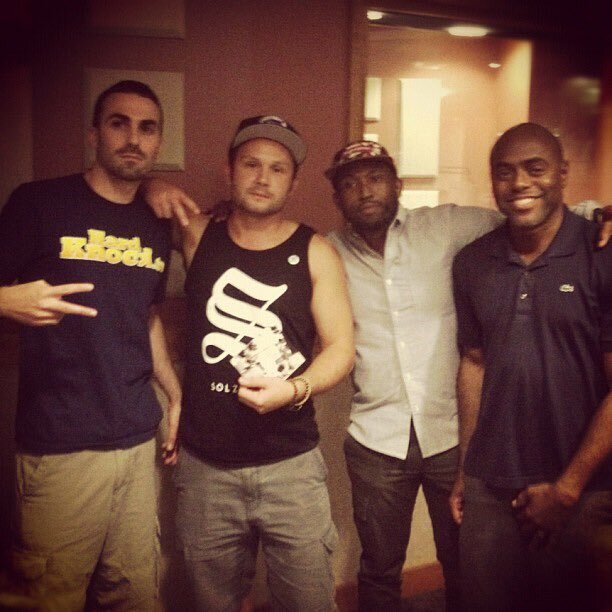 It was especially fun to interview Maseo again, an absolute hip-hop legend. We chatted about De La’s history, NYC rap over the years, the artificial nature of the commercial vs. underground divide (including his regret for being a part of the Roots’ “What They Do” video), and of course, his friendship with Jon that dated back to 1989! Vinny & Johnny, the Merlot Brothers. Shout to all the fellas for coming through and helping send off Jon right. Continuing our string of Sound Session guest hosts, this week we welcomed some of J. Moore’s favorite artists (and people!) in the town, The Physics and Malice & Mario Sweet. We chatted about their work and personal relationships with Jon, and played a few of his favorite records from the Physics family. Any loyal SNSS listener knows how much we love their crew, so it was impossible to pick just one track to play. Enjoy those classics, plus new records from Logic, Jidenna, Kendrick, Rozay, GoldLink, Joey Badass x J. Cole, Stormzy, Evidence, Asher Roth x The Cool Kids, J.I.D, and more. I also highly recommend you check out this tribute to Jon that our friends at The Biggest Podcast put together. You can also listen on any podcast app (iOS users, click here). Another week of Sound Session, another episode packed full of good music and good conversation with some of our favorite folks in the Northwest. This week, Miguel Rockwell (host of The Biggest podcast and member of Clockwork, the fellas responsible for the first local music we played on SNSS) and Sol joined Nphared and I to catch up, talk shop, and share some more memories of J. Moore. We also ran new cuts from Raekwon, Joey Badass + Schoolboy Q, Logic, Anna Wise, Jidenna, Sylvan LaCue, Brother Ali, GoldLink, Kendrick, and more. Throwback in honor of the first album I ever bought, an absolute classic. Enjoy the episode and for those of you lucky enough to get tickets to Jon’s memorial show, we’ll see you Friday. 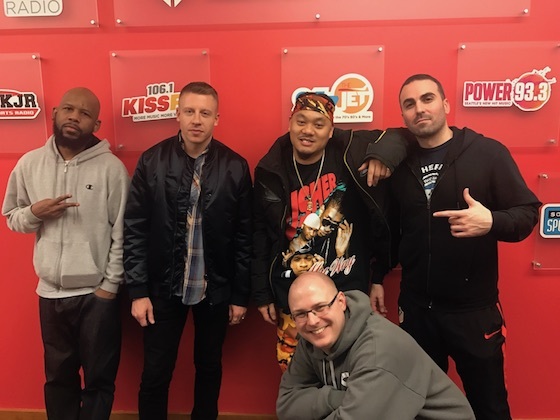 Special episode of Sunday Night Sound Session this week, as Nphared and I were joined in studio by local underground Seattle rapper turned international superstar, Macklemore. Mack’s been a friend of SNSS since the very start and despite all his amazing worldwide success, he hasn’t changed as a person one bit. It’s a testament to his character/personality, and the Seattle hip-hop scene in general, where I’ve always thought our most impressive characteristic has always been our authenticity. 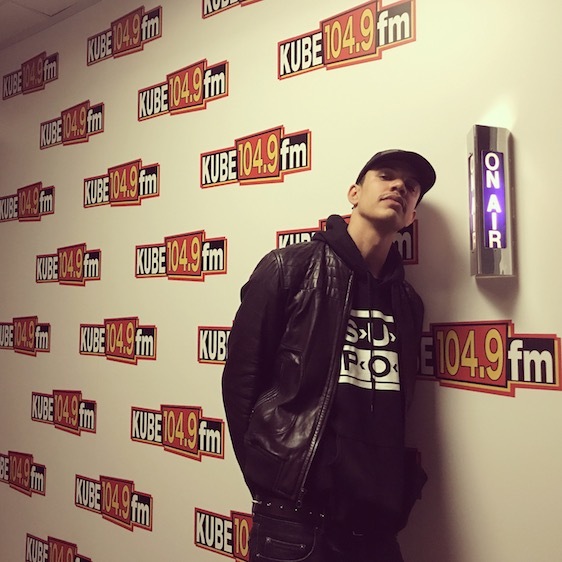 We don’t have a specific “sound” in the Northwest, but instead, the common trait across most of our artists is that they’re pretty much all just genuine, down to earth people. Mack epitomizes that. He’s had years of personal growth and success, but at the core, he’s the same smart, talented, gracious, and hilarious kid he’s always been. Along with our chat, we ran new records from CyHi, J.I.D, Kendrick, GoldLink, Drake, Little Dragon, Amine, Tuxedo, Thundercat, Miguel + Premier, Jidenna, Loyle Carner, and more. Special 20th anniversary throwback in honor of one of the greatest hip-hop albums of all time. Enjoy the show and as you’ll always hear us say going forward: rest in peace to J. Moore. On this week’s episode of Sound Session, DJ Nphared and I ran through new joints from artists like CyHi The Prynce, Smoke DZA, Nick Grant, Vince Staples, Locksmith, SiR + Anderson .Paak + King Mez, Dave B, Big Sean & Jeremih, Smino, King Reign (RIP), Loyle Carner, Porter Ray, Rex Orange County, Matt Martians, Syd, NAO, Gabriel Garzon-Montano, Sonder, and more. Unfortunately, the recording equipment glitched out down the stretch (lost a 3-1 lead) and we missed out on the last 35 minutes of the show. Highly recommend tracking down those records when you have time though. All heatrocks. I assume you’ve already heard the last record from the show though, our throwback to celebrate the 20th anniversary of Erykah Badu’s classic debut album. “Next Lifetime” felt fitting since a) it’s dope as hell, and b) we’re going on a brief 4 week hiatus and will see you again in mid-March. I’m headed down to Brazil for my ESPN day job and while we were able to broadcast from Australia when I was out there recently, the structure isn’t in place to keep that going for this trip. Never fear though, as long as the world is still around in a month, we’ll be back. Feel free to stay in touch on my socials in the interim: Twitter / Facebook / Instagram. See you soon! Happy Super Bowl Sunday from the best city in America! Today, we are all Atlanta Falcons. Apologies for the delay on last week’s SNSS, but we got you. New music from KXNG Crooked (fka Crooked I), Joey Bada$$, Mazzi & S.O.U.L. Purpose, Oddisee, 070, Sampha, Khalid, Eric Biddines, Chris McClenney, Kehlani, Gallant, SiR & Masego, Syd, Tom Tripp, and more. Throwback to celebrate the 20th anniversary of an increasingly underrated classic album too. Co-hosted by DJ Nphared. See you on the air at 10pm Pacific for this week’s episode as well!